If you are planning a trek in Peru but prefer some luxury and you really don’t want to camp then there are a number of excellent options. There are three lodge to lodge mountain treks that offer superb mountain scenery, contact with the local community and a good degree of luxury. Each of the lodge to lodge mountain treks is unique. The lodges vary in size and comfort level, but they all offer en-suite bedrooms with very comfortable beds, hot showers, lounge areas, excellent food and wine, and some have hot tubs also. In all three cases the lodge operators are committed to being environmentally and socially responsible. Food is locally sourced where possible and the staff are generally from the communities where the lodges are located, so there is a good level of community involvement. You get to meet the locals, to see their farming techniques and weavings and even, on occasion, to sing and dance together. Kathy has just returned from Peru where she enjoyed the Lares lodge to lodge trek, having been on the others in previous years. Read on to find out the differences and see which works best for you. This is the toughest and most remote of the lodge based treks. It is suitable for experienced, fit trekkers and requires that you are very well acclimatised to the altitude as you cross several high passes and sleep at high altitudes. You trek for 4 to 6 hours each day. 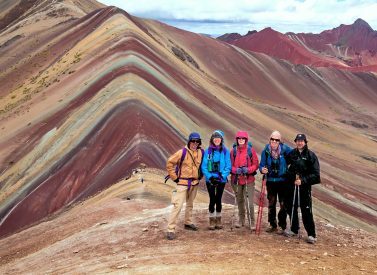 The mountain scenery is superb, and you are trekking far off the beaten track high in remote mountain areas until the last day when you visit the fabulous Rainbow mountain, Vinicunca. The trek is fully supported, all luggage is transported by llama and horse. Staff are from the local Chillca community, who accompany trekkers throughout the route. The lodges are less luxurious than on the other treks, but have wood burning stoves, lounge areas, and double and twin rooms with private bathrooms, with a hot shower. There is only electricity at one lodge, where you can charge batteries and there is no WIFI. We suggest at least a 5 day acclimatisation programme before this trek. We can organise this for you to include some interesting day walks and other activities from Cusco and / or a few days around Lake Titicaca. Preparing for the day, Lares lodge. This is the most flexible of all the lodge based treks. It is ideal for all hiking abilities and interests with optional cultural visits and alternatives trails for guests that prefer not to do tough hikes. There are several guides with each group allowing each person to choose their preferred activity. Each day there is a meu of three activities to choose from – a tough walk, a less tough walk and a cultural activity. This allows for a wide diversity of people, some that don’t want to do any trekking, others that only want to do trekking, but with the luxury of good lodges at the end of each day. This Lares trek is great for families and groups of friends with different interests. Kids and parents can choose different activities, and there is bound to be one activity suitable for each member of the group. The lodges are large, spacious, and very comfortable. There are hot tubs at the first two. The first lodge has outdoor hot tub and a full-sized billiard table, kissing llamas, and large gardens – fabulous for kids. There is wifi in all the lodges. Meals are buffet, snacks are healthy and plentiful, trekking meals are exceptionally good. For families with kids that want to trek but would like a back up there is an option to hire a horse. The highlights are the scenic off the beaten track walking days, the fabulous Inca sites of Pisac, Ancasmarca, Ollantaytambo and Machu Picchu, lots of colourfully dressed locals, and interaction with local people. You get to eat a Pachamanca and see farming and weaving demonstrations. We suggest two nights, to aid acclimatisation, in Cusco before this programme, which we can organise for you. This is a tough 7 day trek through the beautiful mountain range, the Cordillera Vilcabamba, which surrounds Machu Picchu. Some days are long and hard but the lodges offer hot showers, gourmet meals, wine, goose-down bedding, outdoor jacuzzis, and personalized service. The first few days you almost rub shoulders with the glaciers of Salkantay and Humantay. You trek over a high pass and then as you descend pass through a variety of eco-zones, fabulous for flowers, birds, and changing in scenery. The Inca site of Llactapata is a highlight and gives a unique view over Machu Picchu. High altitude is an issue on this trek so we recommend an acclimatisation period of 5 days before starting the trek. We can organise walks and other activities around Cusco or a few days around lake Titicaca, if you prefer. If you would like to start planning a lodge to lodge, or camping trekking holiday to Peru, just get in touch with us at Andean Trails, and we can help – for families of all sizes and all ages. So difficult to settle back into life after that amazing experience! Everything far exceeded my expectations - what amazingly friendly people we have encountered - and fantastic food, such a shame that at altitude I had no appetite! I think the highlight of the trip was the Salkantay Lodge to Lodge trek, this was pure luxury all the way and the guides were quite amazing. The group we travelled with were fantastic, everyone willing to walk at the same speed and enjoy each others company.